Dr. Ornish's Diet is called the "Life Choice Diet" and differs radically from the high-protein diets that are popular today. It is a vegetarian diet that relies on a simple ratio of 10 percent fat, 15percent protein and 75 percent carbohydrates. The emphasis in this equation should be put on the 10 percent fat. Dean Ornish's Diet does not find any extraneous fat acceptable, be it lard or olive oil. It should be noted that this diet was introduced to the public in 1993, before research about the benefits of olive oil and other beneficial fats became widely known. However, like the high-protein diet doctors, Dr. Ornish emphasizes the importance of keeping insulin levels at a stable level and eating foods in their purest form, so there is some common ground. The Life Choice Diet is definitely a good option for people who are vegetarians or even vegan, as the diet discourages excessive consumption of eggs, cheese and other dairy products. What Foods Can I Eat on the Life Choice Diet? The diet is built primarily around three categories of food: beans, fruits and vegetables, and grains. Other foods, such as nonfat dairy products and nonfat desserts, are allowed in moderation. Dr. Ornish makes the point that if these foods are avoided, counting fat grams is not necessary. The consumption of complex carbohydrates is encouraged. If you are going to eat bread, high-fiber bread is recommended. Brown rice, a variety of legumes and whole grains are highly suggested foods to consume as well. For example, it is not uncommon to eat quinoa on the Dean Ornish Diet. How Many Calories Can I Consume Each Day? According to Dr. Ornish, if high-fat foods, alcohol, and sugar are avoided consistently, a person will not have to be burdened with counting calories. However, he does encourage people to eat in moderation. This is not one of the diets where you are encouraged to eat the recommended foods until you are stuffed. The Life Choice Diet is promoted as a lifestyle, rather than a short-term solution. Hence, food should be approached in a different way for long-lasting dietary and weight changes. 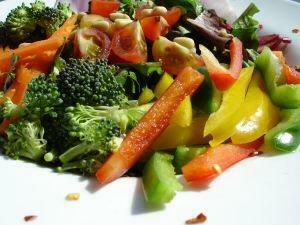 Part of changing your eating habits requires developing an attitude of mindfulness. Dr. Ornish is not a proponent of eating on the run, as so many of us tend to do. It is recommended that you choose one or two places in the house where you will consume food, and confine your eating to those areas. This way, instead of eating mindlessly on the couch in front of the television or with a good book, you will perhaps be eating at your dinner table, with a flower centerpiece, and enjoying the food and conversation. You are encouraged to pay attention to what you are eating. Does the food taste tangy, salty or spicy? What is the texture? Dr. Ornish believes we will consume less by paying attention to these points. You may also try cutting your food into smaller bites in an effort eat slowly. You may find that you are satisfied before you have finished what is on your plate. Paying attention to these sensations is advantageous toward your efforts to eat smaller portions. Asking yourself if you are truly hungry before you decide to eat is beneficial to your mindfulness about eating, which is meant to satisfy hunger and not much else. Habits are not easy to break, but eating the habitual snack before bedtime does not mean you are necessarily hungry. If you feel like eating when you are not physically hungry, examine what you may truly need. Choose to write in a journal, occupy your hands by knitting or interest your mind in another activity. Eventually, by following this diet, you will find you are eating low fat as a lifestyle, but before you start this or any diet it is wise to talk to your personal healthcare provider to be sure it is a healthy choice for you.